David Min (the lead rebutter of Wallison and Pinto’s theory of subprime mortgages, which relied on a made-up definition of “subprime”) has a new paperexplaining why this is likely to fail. 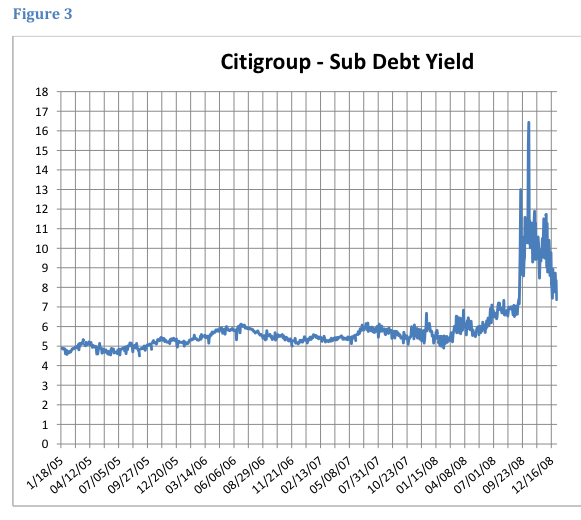 (The Citigroup chart is from the paper.) The remarkable thing is that market discipline not only failed to prevent banks from taking on ill-advised levels of risk, but also failed to even identify those risks until well after they were splashed all over the front page of the Wall Street Journal—like the credit rating agencies downgrading Enron mere weeks before it filed for bankruptcy.